The North Dakota Attorney General says Dakota Access’s land purchase violates the state’s corporate farming law, according to a July 3 Bismarck Tribune article. The company purchased much of the Cannonball Ranch north of the Standing Rock Sioux Reservation in fall of 2016, when pipeline protests were ongoing in the area. State law prohibits corporations and limited liability companies from owning or leasing farmland and ranchland unless the land is necessary for commercial development. According to the Lakota People’s Law Project, this could have a significant impact on criminal charges leveled against water protectors arrested on this property. Since Dakota Access LLC didn’t legally own the land, it didn’t have the right to tell the authorities to evict water protectors. Attorneys for water protectors at the Standing Rock say they had a significant victory in court Wednesday, including the right to key information that the state so far has withheld. They also won the right to depose members of the private security firm Tiger Swan as well as other law enforcement officials. The legal team also learned that key evidence most likely was destroyed. 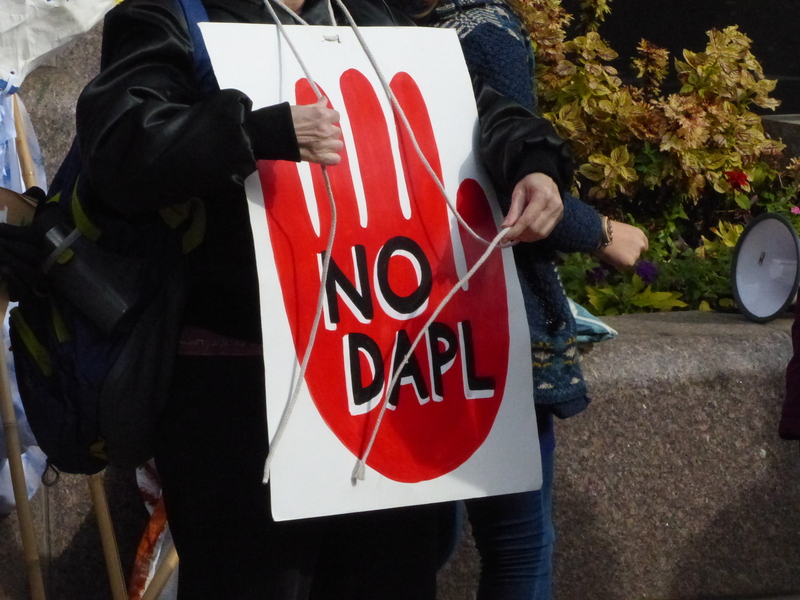 Quick check in: Standing Rock hasn’t been in the news recently, as attention has shifted to efforts to stop the Enbridge Line 3 tar sands crude oil pipeline through Minnesota. But water protector cases are still being prosecuted in North Dakota, long after the Dakota Access Pipeline forced its way under the Missouri River near Standing Rock. For months, the State of North Dakota has failed to pursue or provide required evidence to the defense team representing Lakota People’s Law Project Lead Counsel Chase Iron Eyes. At a crucial hearing on Tuesday, Apr. 4, Judge Lee Christofferson made several rulings in favor of the defense. Christofferson ruled that Morton County Sheriff Kyle Kirchmeier and the State of North Dakota must hand over all missing evidence by May 1, and he scolded the deputy state’s attorney for his lack of action. Christofferson also granted defense lawyer Alex Reichert and Lakota People’s Law Project attorneys Daniel Sheehan and Lanny Sinkin the authority to subpoena employees of TigerSwan, the mercenary security firm hired by Dakota Access pipeline parent company Energy Transfer Partners. Our defense team alleges that TigerSwan ran a targeted, racist, no-holds-barred surveillance and smear campaign against Chase and other water protectors. The defense team wants to show what it says was illegal collusion between industry, law enforcement, and TigerSwan. Click on the link above and you can watch a 36-minute video of defense attorneys talking about recent developments. The highlights follow. Top democratic U.S. Senate leaders are pushing the U.S. Army Corps of Engineers for detailed information on the steps it took to approve the Dakota Access Pipeline (DAPL), what plans it has to provide clean drinking water in case of a pipeline rupture, and what steps it took to honor the treaty and trust obligations the government has to the Standing Rock Nation. Thanks to the Lakota People’s Law Project for posting this information. Senators Tom Carper (D., Delaware), Ranking Member of the Senate Committee on Environment & Public Works, and Maria Cantwell (D., Washington), Ranking Member of the Senate Committee on Energy & Natural Resources, have sent an oversight letter to the Army Corps of Engineers demanding documentation about its rushed DAPL approval, including all communications and contact with the Trump transition team and administration. A ruling in a Morton County, North Dakota courtroom shows how people in our nation live in very different worlds and how much work we have ahead to find common understandings of fairness and decency. A Morton County jury found eight Dakota Access Pipeline (DAPL) protesters guilty of disorderly conduct, according to a story in the Bismarck Tribune. The court fined them between $1,250 and $1,685 each. Their crimes included such actions as “sitting on a gravel access road built by the company, pushing into law enforcement and standing in the road,” the story said. The fines came after a request from Ladd Erickson, a special prosecutor for Morton County, who contends the protesters wanted to inflict harm on the state, people and police. Seventy-six people were arrested as they tried to establish a new camp to oppose the Dakota Access Pipeline (DAPL) according to a story today in the Bismarck Tribune. Among those arrested was Chase Iron Eyes, a former Congresssional candidate and legal counsel with the Lakota People’s Law Project. Those arrested have been spread out to five different North Dakota county jails. The story said the arrests took place on private property located on the west side of N.D. Highway 1806, on top of a hill across from the main Oceti Sakowin camp.